Professor Adamowski is a tenured Associate Professor in the Department of Bioresource Engineering in the Faculty of Agricultural and Environmental Sciences at McGill University. He is also the Director of McGill's Integrated Water Resources Management Program and Interim Director of McGill’s Brace Centre for Water Resources Management. 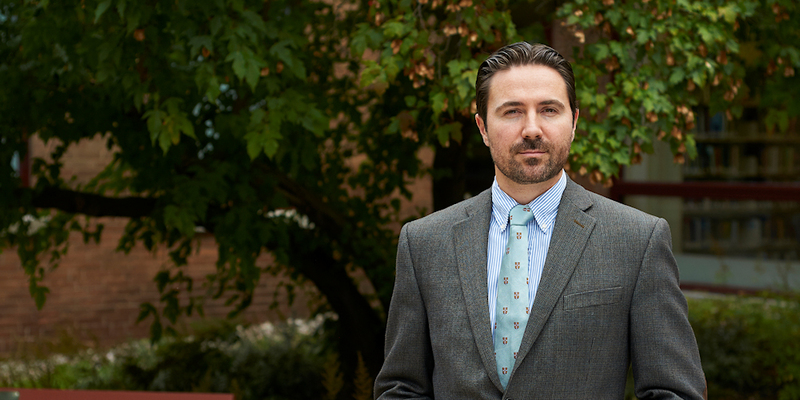 In recognition of his contributions to research in hydrology and water resources engineering and management, Professor Adamowski was recently elected as a member of the College of New Scholars, Artists and Scientists of the Royal Society of Canada. He is registered as a professional engineer (P.Eng.) in the province of Ontario, and serves on several international committees, as well as on the Editorial Boards of numerous international journals (e.g. Water Journal; Proceedings of the Institution of Civil Engineers (ICE): Engineering Sustainability). He is also currently the Vice President (Technical) of the Canadian Society for Bioengineering. His research and teaching interests are in the areas of statistical hydrology and water resources engineering and management, with a particular focus on the development of new artificial intelligence approaches in hydrology, and the development of new participatory systems thinking and modeling approaches in water resources engineering and management. Professor Adamowski has published over 220 research papers in refereed journals and 60 papers in refereed conference proceedings, as well as three books, numerous chapters in books, and several monographs. He has also given over 50 research talks at academic conferences (including over 10 Keynote Talks at conferences). Throughout the course of his research career, he has conducted research with his students in over 30 countries. Professor Adamowski is currently the supervisor of three Postdoctoral Fellows, seven PhD students, and four MSc thesis students at McGill. As part of his duties as the Director of McGill’s Master of Science in Integrated Water Resources Management Program, he supervises between 20 and 30 IWRM Master of Science students each year. Professor Adamowski came to McGill University in 2009 after working as a Post Doctoral Associate at the Massachusetts Institute of Technology in the USA. He completed his graduate studies in the US and Europe at several universities (Cambridge, MIT, London Business School, HEC Paris, NHH Bergen, and Warsaw Technical University) and his undergraduate degree in Canada at the Royal Military College of Canada. Prior to pursuing his graduate studies, he worked as a Lecturer in Tokyo, Japan for one year. During and after his undergraduate studies, he served in the Canadian Armed Forces (Reserves) for over six years, first as an Infantry Soldier in the Canadian Army, then as an Officer Cadet at the Royal Military College of Canada, and finally as an Officer in the Royal Canadian Navy. Professor Adamowski grew up in Ottawa, Canada, and attended Rockcliffe Park Public School and Lisgar Collegiate Institute. Editorial Board - Journal of Sustainable Water Resources Management (Springer). Editorial Board - Journal of Modeling Earth Systems and Environment (Springer). Editorial Board - Proceedings of the Institution of Civil Engineers (ICE): Engineering Sustainability. Editorial Board - Water Journal. Editorial Board - Journal of Water and Land Development. Professor Adamowski has conducted research projects in the following countries: Canada (Quebec, Ontario, Arctic, British Columbia, Alberta etc...); USA; Mexico; Germany; Cyprus; Poland; Italy; Egypt; Jordan; Israel; Iran; India; Nepal; Cameroon; Guatemala; Brazil; Spain; China; Ethiopia; Australia; Hungary; Japan; Tanzania; Nigeria; Pakistan; Kyrgyzstan; Mongolia; Algeria; UK; Saudi Arabia; and Cuba. “Élaboration d'une approche de modélisation inverse fondée sur le couplage de l'optimisation-simulation visant à identifier les sources de contamination des eaux souterraines et des méthodes d'assainissement appropriées pour le Québec”. “Improving the Inclusiveness of Participatory Socio-Environmental Modelling for Water Resource Management with Diverse Communities”. “Assessing the Impact of Climate Change on Montreal's Precipitation Characteristics”. “Evaluating the Potential of Supplemental Irrigation to Increase Agricultural and Water Productivity in India with Climate Change”. “Novel Approaches in Statistical Analysis and Coupled Social-Physical Systems Modeling for Integrated and Adaptive Water Resources Management in the Face of Increasing Uncertainty”. “Understanding Game Based Approaches for Improving Sustainable Water Governance UpSWinG”. “Development of State-of-the-art Artificial Intelligence River Flood Forecasting models”. “Framing Environmental Flows as Providers of Ecosystem Services: Implications for Policy Implementation”. “Development of a New Approach based on Infrared Spectroscopy for Black Plastic Sorting in the Recycling Industry". “A New Tool for Unraveling the Effects of Climate on Demand of Urban Water Supply Systems Using New Statistical Analysis Techniques (‘Water Demand Climate Correction Tool’)”. “A New Framework for Nonlinear Input Variable Selection Coupled with Ensemble-Wavelet-Machine Learning Methods with Uncertainty Assessments for Urban Water Demand Forecasting”. “Agriculture, Water and Climate Change in Quebec Watersheds: Transforming Societal Institutions to Collaborative Adaptive Systems to Increase Social-Ecological Resilience”. “Development of New Methods to Investigate and Predict Urban Heat Island Effects on Water Resources Using Remote Sensing and GIS”. Bioresource Engineering: Principles and practices of engineering for sustainability. Emphasis on environmental, economic, social, management and policy factors that should be incorporated into sustainable approaches to engineering and design. Topics will include: sustainability metrics, systems thinking, stakeholder engagement, and leading change for sustainability within companies. Bioresource Engineering: Placement in a government, or private sector agency for 13 weeks of full-time work on an integrated water resource management project (35 hours per week). Student shall be responsible for defining a mandate, then performing and reporting on the work/research performed. This course is now to be offered both in the Winter semester (new) and the Summer semester (current). Bioresource Engineering: To broaden the scope of the IWRM internship experience (BREE 630) in the form of a research paper or 'plan of action' that expands on the water resources management problem(s) or issue(s) examined in the internship. This course is now to be offered both in the Winter semester (new) and the Summer semester (current). Bioresource Engineering: Class visits to various firms and agencies working in the realm of integrated water resources management. Symposium on Climate Resilient Urban Water Systems: New Technologies and Policy Challenges. Hong Kong, China. European Geosciences Union General Assembly. Vienna, Austria. 36th International Conference of the System Dynamics Society. Reykjavík, Iceland. Computational Methods in Water Resources XXII. Saint-Malo, France. Congreso de la Sociedad Latinoamericana de Nutrición. Punta Cana, Dominican Republic. IEEE Conference on Computational Intelligence and Big Data Management. Macau, China. 7th International Conference on Water Resources and Environment Research. Kyoto, Japan. NABEC Annual Conference. Orono, Maine, USA. Annual Hydrological Congress. Warsaw, Poland. 14th International Conference on Machine Learning and Applications. Miami, USA. Beijing University of Science and Technology Workshop on Water Resources Management. Beijing, China. ASABE Annual International Meeting. New Orleans, USA. 3rd International Conference on Water Economics, Statistics, and Finance. Marbella, Spain. Brazilian Symposium on Water Resources. Rio Grande do Sol, Brazil. 6th IAHS -EGU International Symposium on Integrated Water Resources Management. Bologna, Italy. IDRC Workshop on Malnutrition in Guatemala. Institute of Agriculture, Natural Resources and the Environment. Guatemala City, Guatemala. Hydrological Modeling Symposium. University of Basilicata, Italy. ASABE Annual International Meeting. Kansas City, Missouri, USA. Northeast Agricultural/Biological Engineering Conference. Altoona, PA, USA. Conference on Engineering Education for Sustainable Development, University of Cambridge, UK. Canadian Water Resources Associate Joint Scientific Conference. Saskatoon, Canada. International Interdisciplinary Conference on Land Use and Water Quality: Reducing Effects of Agriculture. The Hague, Netherlands. Conference on Methods and Technologies for Environmental Monitoring and Modelling: Hydrological and Hydraulic Risk. Matera, Italy. Polish Institute of Meterology and Water Management / Polish Academy of Sciences Conference on Current Issues in Hydrology. Warsaw, Poland. World Congress on Engineering and Technology. Xi'an, China. ASABE Annual International Meeting. Dallas, Texas, USA. 8th Watershed Management Conference. Lorestan, Iran. ASABE Annual International Meeting. Louisville, Kentucky, USA. Third International Conference on Climate Change. Rio de Janeiro, Brazil. Northeast Agricultural/Biological Engineering Conference. Geneva, NY, USA. American Geophysical Union Fall Meeting. San Francisco, CA, USA. CSWCRTI Workshop on Adaptive and Sustainable Solutions for Water Integrity, Safety, Security and Supply. Chandigargh, India. 13th Biennial Jerusalem Conference in Environmental Studies. Hebrew University, Jerusalem, Israel. Canada-Mexico Industry-Science Workshop for Innovation in Water Sustainability Technologies. Mitacs Canada and Foreign Affairs and International Trade Canada. Chihuahua, Mexico.